Home Entertainment Here Are the ‘Running Man’ Episodes with Appearances by Actor Ji Sung! Here Are the ‘Running Man’ Episodes with Appearances by Actor Ji Sung! 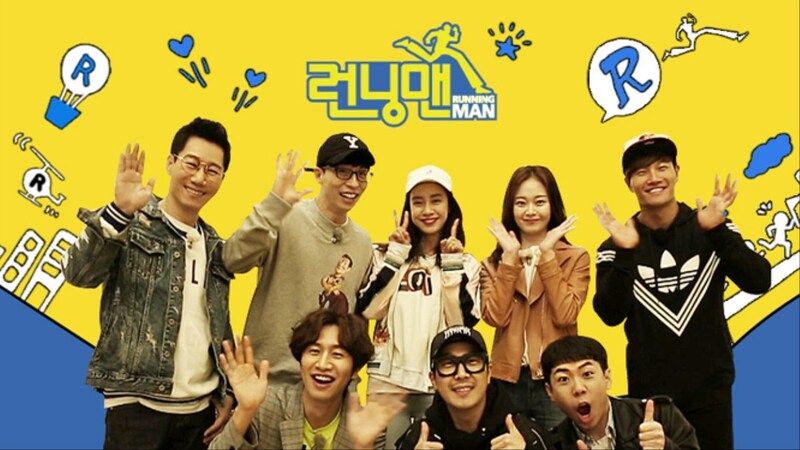 Running Man is a reality show that has been airing since 2011. Since then, the show been visited by many guests from entertainment industry, including lots of actors and actresses. The guests have to go on missions with the Running Man cast members, who are Yoo Jae-suk, Kim Jong-kook, Ji Suk-jin, Song Ji-hyo, Lee Kwang-soo, Yang Se-chan, Haha, and Jeon So-min. One of the actors who has appeared on the show several times is Ji Sung. For the record, he has been a guest for four episodes. So, wanna know more about Ji Sung’s appearance in the show? Here’s the list! Episode 54 was broadcast on July 31, 2011. Ji Sung was a guest on the show, along with actress Choi Kang-hee (7th Grade Civil Servant, Queen of Mystery), in order to promote their new drama, Protect the Boss, where the two actors had the starring roles. The two actors were told by PD to make their own team by picking the members on their location. Ji Sung pulls up Yoo Jae-suk and Lee Kwang-soo and they formed one team. Before Ji Sung came, Yoo Jae-suk and Lee Kwang-soo were teamed with the PD. Lee Kwang-soo’s arrival was joked about, calling him the Kwangvatar. Meanwhile, Choi Kang-he picked Kim Jong-kook and Haha. Haha’s excitement couldn’t be hidden when he knew he would be teaming up with Choi Kang-hee. The remaining members, Song Ji-hyo and Gary, picked Ji Suk-jin. Their mission was to guess who the boss was from each group, and collect all of their nametags. The boss was the person that sitting in the back seat of the car. Ji Sung’s team’s boss was Lee Kwang-soo. Because he was chosen to be the boss, Lee Kwang-soo felt like he was a hero, because most of the time his character is weak or a loser. Choi Kang-hee became the boss on her team, and Gary was the boss on his. To get clues about the boss’s identity, the teams had to play games. Yoo Jae-suk and Lee Kwang-soo relied on Ji Sung’s brains. When Yoo asked what his IQ was, Ji Sung confidently answered, “It’s over 100…” With their confidence, the team was driving to Yeouido Park. The mission they were given was to ride bicycles in the heat. Unfortunately, they failed the mission and had to move on to the next one. The other team won and obtained the clue that read that “Kwang” that means ‘zero’ in Korean. Ji Sung’s team’s next mission was a tongue twister. If they failed to read the words correctly, the microphone would blow air. They failed several times, but finally completed the task and won a clue. 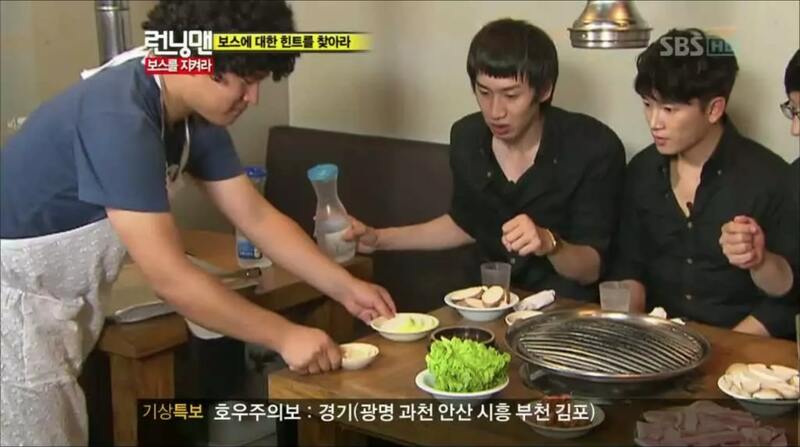 Their last chance to obtain a clue was to guess the order of dishes that were placed on the table by maknae FD. They happily ate, and after several tries, they successfully completed the mission and received their clue. The clue they got was directed to Choi Kang-hee. After completing the missions for clues, each team got a mysterious call and had to pick up the call on different floors. Each team received the final mission, to collect all the boss’s nametags and to find ‘Lavenders’. Ji Sung’s team headed to the 60th floor in a clear elevator. While riding it, they were jokingly about what would happen if Kim Jong-kook found them and scared them as ‘Spartakook’. They also joked about what if Kim Jong-kook was able to climb the wall like Spiderman. Before they headed to the 60th floor, they had a meeting at the stairs to decide which member would have to fight ‘Spartakook’. Because Lee Kwang-soo is quite tall, the team can be found easily by the others, even though they are hiding. Choi Kang-hee’s team was trying to steal Kwang-soo’s nametag because the clue they missed, Kkwang and Ugly, was referring to Kwang-soo. During this time, Haha was able eavesdrop, obtaining the information that Kwang-soo was the boss for Ji Sung’s team. Both teams were trying to steal Kwang-soo’s nametag. Because he was scared, Kwang-soo ran away and hid behind the big bowl. While he was hiding, the other members were fighting to steal each other’s nametags. Jae-suk told Kwang-soo to steal Kang-hee’s nametag, and they were pretty aggressively trying to steal each other’s tags. Jae-suk tried to help Kwang-soo, but it was no use because Kang-hee was strong and she was teammates with Kim Jong-kook. In the end, Choi Kang-hee’s team won and each member of the team got a gold ring as the prize. Also, right after the show aired, Ji Sung’s IQ become news, because of his high score. Episode 116 broadcast on October 21, 2012. The guests in this episode were the actors from the drama The Great Seer; Ji Sung, Song Chang-eui (Life is Beautiful), and Ji Jin-hee (Dong Yi). As with Ji Sung’s previous appearance, he guested again in order to promote the drama. The actors and Running Man members had to ride the KTX to the final location. On the way to the location, the PD gave them a mission: Survival Train Ride. The members had to play the game, and if they’re failed, they were eliminated and dropped off at the station. The eliminated members had no choice but to go to the next mission location by themselves. The first mission was to flip the coin. The rule was that they had to flip the coin on the book by banging their hand. If the coin flipped, they won. If the coin didn’t flip, they lost. Ji Sung and Ji Jin-hee safely won the game. However, Song Chang-eui lost and was dropped off at the next station. At the opening, Kim Jong-kook made a prediction that Song Chang-eui would be eliminated first, and he was right. The PD edited his prediction with an old-time magic effect. The second mission was choosing a numbered ball. One ball was labeled ‘Eliminated’, and any player choosing that ball was, of course, eliminated. This time, Ji Suk-jin was eliminated after teasing Yoo Jae-suk. For the third mission, the members had to play ‘Cham-Cham-Cham’. The rule for this game was that you had to avoid the direction from the pointer. The chances of this game were 50:50, whether you would face in the same direction or not. Unfortunately, in this mission, it was Ji Jin-hee who was eliminated. For the fourth mission, the remaining members had to hula hoop for five minutes. Even though Kim Jong-kook has a big build and lots of muscles, he couldn’t keep going for a full five minutes, and was eliminated at the next stop. The final mission was the Nunchi game. The rule of the game was the members had to squat, then stand and shout their number. If there were two people standing at the same time, then they lost. This mission eliminated Haha, Gary, and Song Ji-hyo. Ji Sung was still on the train with the remaining members, and they headed to the last mission. The final mission was held at an old-time movie set, to match the mission’s theme. There were four remaining members; Ji Sung, Yoo Jae-suk, Gary, and Lee Kwang-soo. Their mission was to find Ddakji in the set, to help them get unknown powers. The members were fighting and trying to steal each other’s ddakji. While they were fighting, suddenly a bunch of Ahjummas caught them and then disappeared. However, each ddakji has its own specialty. One of them predicts and sees the future. Every time a person shouts this, the members were blindfolded and the one who has that power can know what is going on later. Anyway, the past-and-present theme was kind of confusing and chaotic, because the members suddenly would tear each other nametags. Ji Sung managed to rip Haha’s name tag. After that scene, the chaos continued when Song Ji-hyo was trying to steal other;s nametags with a bunch ahjummas running after them. She managed to got some nametags, one of them Yoo Jae-suk’s. In the end, the remaining members were Monday Couple (Song Ji-hyo and Gary) and the three cast members. Song Ji-hyo tore Ji Sung’s name tag, and then Ji Jin-hee was ripping Song Ji-hyo’s name tag. Ji Jin-hee was the last remaining guest. He fought with Gary and finally he managed to rip Gary’s nametag. Ji Jin-hee was the winner! Before the show aired, rumors about who the actors that would be guests in the show were all over SNS with hashtag ‘Iksan Suncheon’ on May 8, 2012. Then Ji Sung’s agency confirmed the news that he would be appearing. Ji Jin-hee’s agency also confirmed the actor’s appearance in the show. People were anticipating their appearances, because the actors are rarely in the variety show. Are You Curious About MBLAQ’s Leader Yang Seung-ho’s Latest News and His Military Service?